Spotted today under the arm of a student at a New York college: Roberto Bolaño’s The Savage Detectives. I’ve written here about the speed of this author’s induction into the pantheon. Nonetheless, it was remarkable – to me, anyway – to learn from this student that TSD had popped up on an English class syllabus. For the record, the student reports that he likes the book so far. (Me, too, kid. Raciest required reading this side of The Kama Sutra. Comparative religion rules!) His other classmates? Not so much. I guess in our world – unlike Bolaño’s – youth is sometimes wasted on the young. All too true, Michael. All too true. I am 22 and study at NYU now. Sometimes on the subway I opt to read an ebook on my iPhone, and sometimes I pull a printed book out of my bag to read. I have also noticed I am one of the few reading books, while most people seem to be playing games or listening to music. I love riding BART to work and checking out other people’s reading. Maybe it’s because going under the bay makes the network spotty, but I see about equal numbers of screens and books/papers/mags. But I am sure it will all slowly switch. I think that the author is being a tad hyperbolic, and I don’t understand what this post is arguing. As a longtime New Yorker, I don’t recall the subway being a “rolling library” in 2004, and subway readership rates are not harbingers of the end of literature. I think it’s quite a romanticized view of the subway to claim that in 2004, the subway was some sort of egalitarian literary salon, where high-minded academics and plebeians gathered to read their books and newspapers. This is evidenced by the highly questionable and obnoxious claim that those residing closer to Manhattan were more likely to be reading the Times or the Journal. How one could possibly determine another commuter’s residence based on their choice of newspaper is beyond me? In fact, I’d imagine that a fair amount of the people on subways that are reading any newspaper at all are from outside Manhattan. 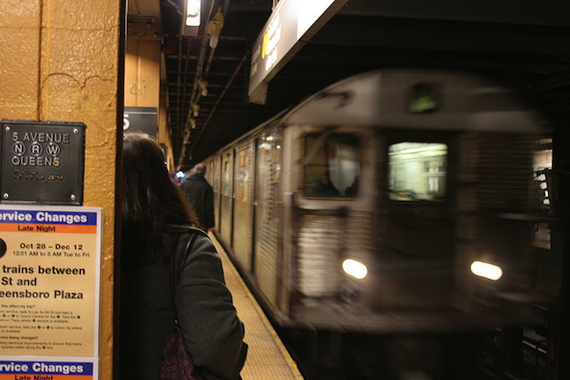 NYC’s daytime population nearly doubles due to commuters, and bridge and tunnel commuters are probably more likely to have the time to read newspapers, particularly longer newspapers like the NYTimes and the Journal. With respect to the impact of smartphones or tablets on reading in the subway, I’m not convinced that the devices alone have had any impact on readership, and I certainly wouldn’t believe so without firm evidence. Even if people do read less now on the subway, I’d point to the pernicious effect that these devices have had on people’s worklife balance. People are now expected to answer emails and deal with work issues throughout the day. This is a particularly pressing issue in the morning as people are commuting to work and checking morning email and calendars. I also don’t see how anyone could attempt to comment on this issue at all without considering the increasing workday of the American worker. Taken together, these factors alone could help explain why people on the subway may opt for less engaged diversions than reading. That doesn’t necessarily mean people are not reading or that literature is ending or that we need to wait for some sort of rebirth a la 1970’s cinema. It may just mean that the overworked, constantly connected, American worker just wants to relax and listen to some music or play candy crush.